Transforming a compact bathroom into a relaxing haven of bliss is no easy feat. There’s logistics to consider from squeezing in all the necessary fixtures and fittings to adding those all-important finishing touches. And you’ve somehow got to co-ordinate this challenging renovation without making the room look cluttered. Although it may seem like a job for the professionals, there are several handy tips worth considering when designing smaller bathrooms. Even for the amateur embarking on some light DIY, these design choices can make a surprising impact to the look and functionality of the room. Nothing takes up more valuable space than a horizontal radiator. To overcome this issue and take some of that storage space back, why not install a shelf to sit above the radiator? Marble looks especially good in a bathroom as a luxurious finish to an otherwise minimalist design. 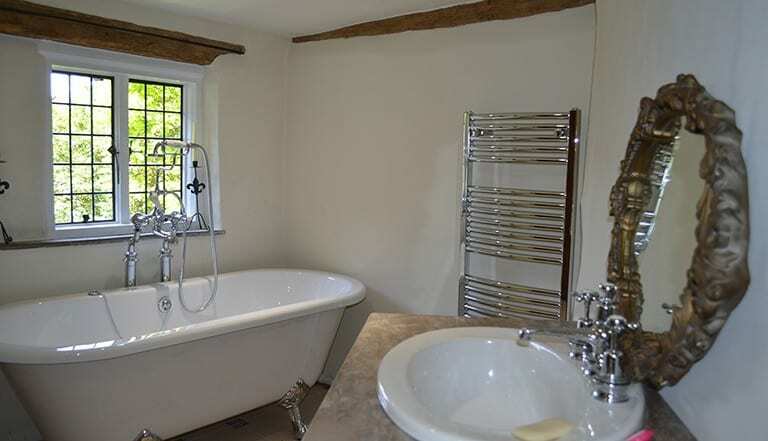 Alternatively, switch out an old radiator entirely in favour of a more modern vertical slimline towel rail. Not only do these save space while heating the room to an efficient toasty warmth but they provide useful storage for all your towels. Most bathrooms are designed with the sink sitting opposite from the shower, but this isn’t always feasible for the smaller bathroom. Many opt for a pedestal sink but even this offers little in the way of improved usability or space saving convenience. Instead, the often-overlooked corner sink could be a solution. Sitting neatly across from the toilet, this leaves the rest of the room unoccupied. Surely, it’s counter-intuitive to add a large patterned wallpaper to create the illusion of space? Surprisingly, that’s not the case as the eye is tricked into seeing more space when confronted with bold patterns. While, an eye-popping theme is never a good idea with a small bathroom, wide-striped wallpaper can work well. The bathroom won’t get any larger, but it will certainly have the look of a bigger room. Modern appliances are way more unassuming that the traditional counterpart. That includes the contemporary selection of vanities and toilets. These can now be fitted to the wall as opposed to the floor. That free floating effect looks stylish while giving the appearance of adding more room. What’s more, the little space now retained under the vanity can be used for storage of smaller items. Why limit the size of the mirror to correspond with the size of the vanity? Choose a large enough mirror that stretches across the entire wall to give the illusion of endless space. This is also great when there’s more than one of you trying to get ready at once. It’s a top interior design tip that can also avoid the inevitable early morning arguments as the family rushes to get ready! Regardless of your bathroom size, any of these tips should help you create an impressive space that’s more than adequate for all your family’s needs.